Mama's Cup: Life in Plastic...It's Fantastic! A million years ago, when I was a struggling actor, I took all kinds of jobs. Many were strange, some embarrassing. But I always figured my myriad odd jobs would make good fodder for when I was working the late night talk show circuit, promoting my Oscar-nominated film. This morning while listening to Morning Edition, I was reminded of perhaps one of my strangest jobs; for one spring and summer, I was contracted to do personal appearances as Barbie. Toy stores, toy fairs, Wal-Marts, my stage was anywhere Mattel might market their mightiest merchandise. I vividly remember my agent calling me, his voice taut, excited and totally upbeat, speaking in the way only agents and used car salesmen do: "I've got the greatest job for you," he promised. A week later, I found myself poking out of the center of yards of poorly-fitted pink taffeta, a Miss America-style sash slung across my chest, proclaiming my temporary identity: Barbie! My direction was simple, but specific: Smile at the throngs of little girls who would bunch at my knees in undulating waves of bubble-gum scented enthusiasm, and sign autographs with a pink permanent marker. (Yes, I practiced the signature so that it matched the logo.) Apart from the pink taffeta, I felt like one of the Beatles. "Where's Ken?" was the most common question posed to me. "Where's your car?" was a close second. "Do you really have an elevator in your house?" was my personal favorite. Other than the occasional leering dad, it wasn't the worst way to make 12 bucks an hour, even if I did have to stuff the front of the dress to appear--um--authentic. At the end of a four or five hour shift, I'd shove my cotton-candy clad self into some little washroom to change, reverse super-hero style. Then, baseball cap pulled low, I'd sneak out a squeaky, shadowed back door, out of the view of little girls and leering dads alike, maintaining the illusion for everyone. As I said, it was Morning Edition's story today that brought all this back for me. 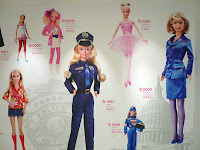 The story was about a life-size House of Barbie that Mattel is opening in Shanghai, in honor of Barbie's 50th birthday. The six-floor, "hot pink shrine" is filled with Barbie-inspired fashion boutiques, a spa and a cocktail lounge, serving--what else?--Barbietinis. Modeled on such a larger-than-life personality, perhaps the only surprising aspect of the House of Barbie is that it took 50 years for someone to build it. My conflicting emotions over Barbie will likely remain so, even as my own daughter discovers the blonde bombshell who, in 2000, conquered the Oval Office--as Commander in Chief, not salacious intern. And so, Barbie, I wish you a very happy birthday. 50 never looked so...tightly-moulded. I raise a Barbitini to you and all you've accomplished, even as I hope you spend the next 50 years breaking through some real glass ceilings, instead of building more glass houses, pink or otherwise. I kept waiting for the photo of you as Barbie...c'mon, you know you have one, let's see it! Super post -- so funny! I can just picture it all!